the soup made by local eateries and raising money for a good cause. DERRY – As soup bowls go, David Batten's is a super soup bowl. The simple white hand-made dish measured close to 12-inches across, including a generous rim. Batten credited his wife with this year's bowl selection – they are regulars at the annual Community Caregivers of Greater Derry Potter's Bowl, and know to arrive early and go for something large. “This is my fourth or fifth serving. I don't think I'll make it through the whole menu,” said Batten, who was doing his best to sample all 10 soups on the menu, donated to the cause by a cluster of local eateries. 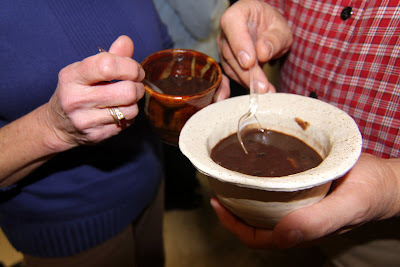 The annual event is the organization's main fundraiser, said Executive Director Cindee Tanuma, during the Saturday night soup fest hosted by Windham Presbyterian Church. More than 210 supporters showed up for the event, a version of the national “Empty Bowls” movement, which has caught on as a popular way to raise money and awareness for hunger. Similarly, Potter's Bowl is the Caregiver's way of raising awareness for the need to build a caring community. The success of the annual event is attributed to its three-tiered approach to pulling off a fundraiser, where everyone walks away happy. Local pottery artisans and high school art students got to promote their wares; local chefs got to circulate their best soups; and local soup enthusiasts got to eat as much as they wanted in a keepsake bowl they were able to take home, from the 300 donated bowls. Teachers from Hampstead Middle School attend each year for a girl's night out and co-worker Katie Wolff's Vegetarian Black Bean soup. Tanuma said more than $6,000 was raised this year, after expenses, which will help continue the good work of the Caregivers, an organization that trains volunteers to provide transportation and a variety of in-home services to those in need in Derry, Londonderry, Windham, Sandown, Chester and Hampstead, free of charge. Leftovers, including breads donated by Panera Bread and pastries from Blackberry Bakery in Londonderry, will provide the basis for tonight's annual “Soup and Bread” night at the Sonshine Soup Kitchen in Derry, making sure none of the good food goes to waste. “It's part of the plan – every Monday following the Potter's Bowl, the soup kitchen has its soup night,” Tanuma said. Paul Lynch of Derry was a first-timer. A self-described foodie, he said he really liked the idea of getting a beautiful bowl while sampling soups. His favored the clam chowder, donated by Windham Junction Country store. “I came to support the Caregivers – and, of course, for the food,” he said. He picked up a small brown bowl crafted by Jessica Seaton of North Hampton. Camilla and Rick Cadieux of Lancaster choose a bowl from the remaining selection of handmade pottery. Another local potter who contributed 20 bowls to the cause was Michael Gibbons of Nutfield Pottery in Derry. He is also a regular at the annual benefit, in its fifth year. “Of course, it gives me exposure and I definitely get business from donating, but I'm happy to support the Caregivers. They do great work,” Gibbons said. Throughout the dinner, guests looked over a table of silent auction items, including artwork, books and handcrafted items made and inspired locally. Autographed books by New Hampshire authors Jodi Piccoult, Dan Brown and John Clayton were available, as well as some unique crafts, like the one that caught the eye of Kate Couture. She had bid on a tote bag woven from 26 actual dollar bills by local seamstress Claire Renaud of the Costume Gallery. Couture was so determined to win the bag that she blatantly hovered near the auction table, ready to out-bid anyone who dared try and usurp her claim on the money bag. Kate Couture scores a tote handcrafted with 26 dollar bills and a Kennedy half-dollar, one of many auction items sold. And she did, as the bidding wrapped up within minutes of her positive affirmation. She hesitated to disclose how much she bid, but said it was more than the $26.50 face value of the bag and much less than the $100 Renaud normally charges. “Oh yeah, I got a real bargain. I'm thrilled. Just don't tell my husband how much I spent on a bag,” she said. Renaud happened to be standing nearby when the bidding ended. She was happy to know that her creation meant so much to someone else. “I had the idea after I was looking at some fabric and realized it was the color of money. I just ironed the bills and stitched around them, then put it all together,”she said. “I made one for myself, and was out for dinner with the bag when Julie (Levesque) from Caregivers came in and saw me with it. She asked me if I could donate one for the auction, and I was more than happy to,” Renaud said. Volunteers are always needed. For more information, go to www.comcaregivers.org or call 432-0877.